The Turkey Run was created in 1974 by Stu Sarjeant. 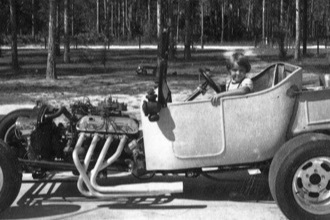 Stu and his five year old son Jim had attempted to enter their 1923 Ford T-Bucket in the 1973 Ormond Beach AACA Gaslight Parade sponsored by the local Jaycees. They were ejected and denied entry as Hot Rods were not permitted. Jim starting crying and asked his Dad if they could have their “own parade” next Thanksgiving. The following year the very first Turkey Run was born. In 1975 Sarjeant along with friends Rick Finzer and Olin Hopes founded the Daytona Beach Street Rods. The first Turkey Run hosted 45 cars and was held at the Howard Johnson hotel near Belair Plaza. Continuing to grow, the show moved to Seabreeze High School in 1982 and added a swap meet. By 1987 The Turkey Run had grown to more than 900 cars and relocated to a property at the Daytona Beach airport. In 1989 the Daytona Beach Street Rods partnered with the Daytona Beach Racing and Recreational Facilities District and found a permanent home in the infield of the Daytona International Speedway. By this time, the show had grown to over 1,500 show quality cars and 250 swap meet vendors. 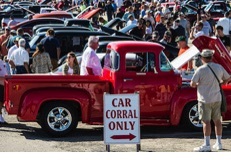 Today, the Turkey Run boasts over 5000 show cars 1200 cars for sale in the Car Corral and over 1,500 swap meet vendors, making it the largest combined classic car show and swap meet in the USA. The Turkey Run is the largest combined Collector Car Show, Swap Meet and Car Corral in the USA. Car enthusiasts from across the US and internationally make their way twice a year to racing's most celebrated location, the Daytona International Speedway. Started in 1974. The event is held on Thanksgiving weekend and the last weekend in March. 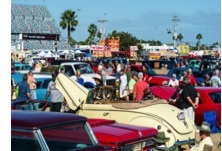 Participants and spectators enjoy more than 6000 vintage, classic, muscle cars, trucks and other wheeled vehicles displayed for show and sale. The show also includes over 2500 swap meet spaces, an Artisan Alley, Live Entertainment and many types of food. In it's history, more than $7 million of profits from the Turkey Run have funded charitable organizations as well as many local programs, projects & recreational facilities.